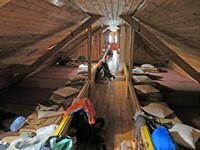 Since the area was pleasant we wanted to spend a second night at the Erfurterhütte. Unfortunately it was fully booked. 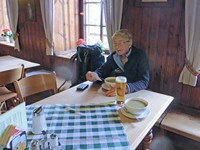 At this point Rosemarie's fluent German came into play and she persuaded the restaurant opposite the hut to let us have a night in a small room they did not normally rent. 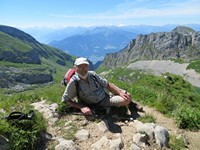 So, having moved our packs across, we had the luxury of a sunny day walking without our heavy rucksacks. 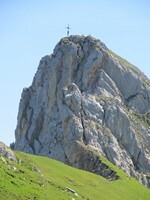 Our destination was the Rofanspitze (2259m) which is just a steep grassy hill. Once there we lazed around in the sunshine and took a few photos. 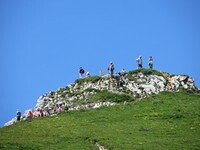 Plenty more people were coming up and creating a small crowd on the top. 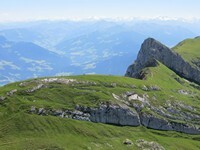 Rosemarie could look across to the Zagzahn, which she had crossed on an earlier trip to the area. We took a few more photos of variable beauty. 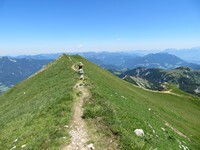 We could then stroll along the ridge and down to where we could overlook the Zireinersee (where we had walked two days before). From below we could take telephoto shots of people on the summit where we had been earlier. 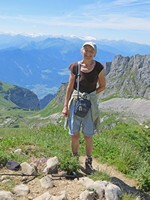 Rosemarie could look up at the Zagzahn - but we did not feel energetic enough to do an out and return to it. 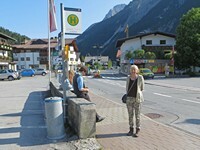 Finally we walked down to our new home for the night - just opposite the Erfurterhütte. Google Maps show our stroll around the summit. An extravagant day. 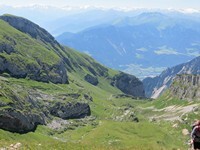 To speed things up we took a cable car and then a bus to get to Pertisau. 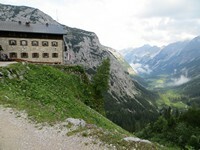 From there we took an antique bus ride up the valley to get near our climb up to the Lamsenjochhütte. 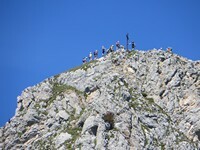 The climb was quite long and felt unrelenting. 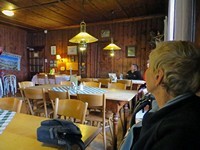 We arrived at the hut to find a brass band had been playing earlier in the afternoon. 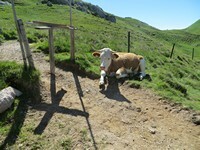 Unlike us they had come up by car on a jeep road from the other side of the mountain! We had arrived just before the main rain of the day and there was some thunder, lightning and rain for those who followed us up. 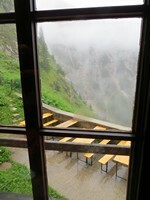 We stayed dry and had a meal before retiring to the Matratzenlager. Not a good day. It had rained heavily all night. After breakfast the rain was still torrential and it continued so for the whole day - and more! Our route was down initially and up later. The afternoon was a continuous walk up through shallow waterfalls! 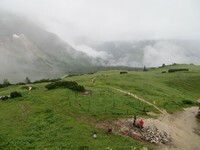 When we arrived at the Falkenhütte we wore nothing that was dry. 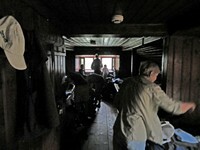 The whole hut was full of walkers' wet clothes - over the bannisters and over the backs of every spare chair. 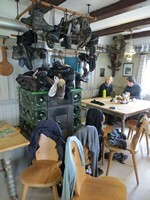 The Kachel Ofen was hung about by boots being dried and there was no place left for mine. 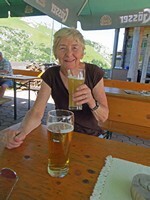 Rosemarie had managed to get her Gore-tex anorak dried overnight. My boots were still oozing water and I had to put soaking wet socks on first! The weather was a huge improvement: only slightly damp today! A good day of walking through varied scenery and paths - mostly woodland and attractive. We arrived quite early at the Karwendelhaus. 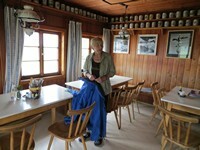 There we had a hot bowl of soup and sat quietly in the warm Gaststube. While we sat I took some photos to make a panorama. Outside the window the rain continued. Damp arrivals would no doubt be pleased to find that this hut boasts an excellent drying room! 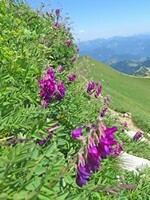 The large Matratzenlager was warm and cosy. This would be our last night in a hut. 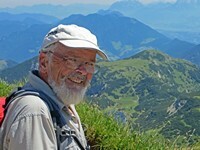 The next stage of the Adlerweg with its 1550m of ascent and its guidebook time of 8hrs was too much for our ancient limbs. We feared that it could take us 10-12hrs! 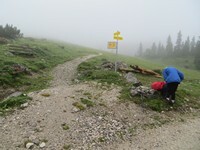 So we left the Adlerweg for the time being and set off down a long valley to the German border. 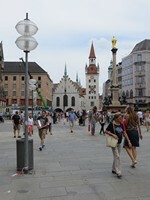 Yesterday afternoon we had managed to book flights home from Innsbruck Airport. 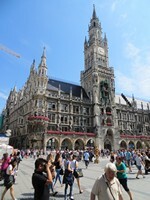 That left us with another day and night so we took a day rail pass and went to Munich for the day. 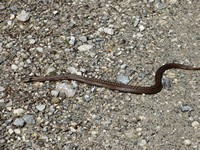 Although our day started with a sad experience it soon picked up again. We had a morning sightseeing and an afternoon walking round the Englisher Garten in warmth and sunlight. 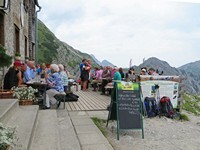 Then back to Scharnitz where, unfortunately, the station restaurant had their Ruhetag on Thursdays! Our last day. 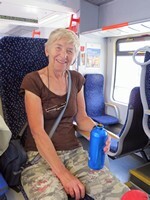 Some train journeys and some tourist strolls and then we were on the afternoon flight back to the UK. A satisfying trip finished - although there was more we would have liked to have done.